A PET scan either positive or negative for amyloid beta changed the diagnosis and treatment for patients in a memory clinic in the Netherlands. Would results from a positron tomography scan — either positive or negative for amyloid-beta — change the diagnosis and treatment for patients with mild cognitive impairment (MCI)? A new study designed to evaluate the use of amyloid PET as a diagnostic tool in daily clinical practice answers yes to both scenarios. The study, which was published online on June 11 in JAMA Neurology, found that both amyloid-positive and amyloid-negative results were associated with a change in diagnosis, diagnostic confidence, and treatment decisions. The study provides an important link between the use of PET imaging and clinical diagnosis and treatment outside a research clinical setting, the lead study author Arno de Wilde, MD, of the department of neurology and Alzheimer Center at VU University Medical Center in Amsterdam, told Neurology Today. The current study was designed as part of the three-year ABIDE (Alzheimer's Biomarkers in Daily Practice) project in the Netherlands to assess imaging in clinical practice outside of a research setting. The researchers offered amyloid PET using fluoride-18 florbetaben to 476 patients who visited the memory clinic of the VU University Medical Center Utrecht between January 2015 and December 2016 as part of the routine diagnostic workup; and 31 patients with MCI from the University Medical Center Utrecht memory clinic. The average age of the participants was 65. Neurologists determined a pre-amyloid and post-amyloid diagnosis that existed of both a clinical syndrome and a suspected etiology of AD or non-AD, with a confidence level ranging from 0 percent to 100 percent. Primary outcomes were post-PET changes in diagnosis, diagnostic confidence, and patient treatment. All patients underwent a standard diagnostic dementia evaluation that consisted of both their medical and informant-based history, comprising results from neurological examinations, neuropsychological testing, basic laboratory testing, and magnetic resonance imaging (MRI). Planned lumbar punctures took place for research purposes; results were not disclosed to neurologists before the association of PET results were assessed. Researchers measured anxiety and uncertainty before and after PET imaging only in patients who underwent amyloid PET on the same day as their standardized diagnostic workup. Before disclosure of the PET results, neurologists determined the clinical syndrome (dementia, MCI, or subjective cognitive decline, and the suspected diagnosis: AD, vascular, frontotemporal dementia, Lewy body dementia, other neurodegenerative disease, or non-neurodegenerative). Then, on a scale from 0 percent to 100 percent, neurologists recorded their diagnostic confidence in the suspected diagnosis. Among the findings, the suspected etiology changed for 24.7 percent of patients after amyloid PET, more often due to a negative (31 percent) than positive (18 percent) result (p<0.01) And these changes were more common among patients 65 years and older (p<.05). The highest prevalence of amyloid PET positivity was among those with dementia (78 percent) and MCI (63 percent) with suspected AD etiology. Those with suspected non-AD etiology had a positive amyloid PET result (25 percent); among these patients, 67 were apolipoprotein E4–positive compared to 29 percent of patients who were amyloid-negative. Diagnostic confidence in etiological diagnosis increased from 80 percent to 89 percent (p<0.001). Post-PET, in 24.3 percent of cases, neurologists changed the treatment for patients, mainly with medication, in patients with positive scans. Overall, the amyloid PET outside of a research setting led patients to receive a more accurate diagnosis and more information on the cause of their symptoms, the study authors wrote. In people with MCI, PET scans could lead to a more accurate diagnosis, alter treatment (if necessary), and improve their prognosis, Dr. McDade said. He added that in the case of MCI, amyloid PET can be quite helpful in clarifying the diagnosis and then counseling patients. But, for patients with subjective clinical decline, it's uncertain whether they should receive PET scans since it's unclear what a positive result could mean, he said. Currently, they do not qualify for the appropriate use criteria — a broad range of specific clinical scenarios by the Amyloid Imaging Taskforce, in which the use of amyloid PET is considered appropriate — although they represent almost one out of four patients in memory clinics. Moreover, these patients are worried and desire more information from their physicians. Beau M. Ances, MD, PhD, FAAN, professor of neurology at Washington University School of Medicine in St. Louis, agreed. Even if a SCD patient had a positive result, “the question is: What is their trajectory?” he said. There is not enough longitudinal data, Dr. Ances added, but he noted that researchers are working on that. “In SCD, a negative result can provide clarity, but it can also not [do that]. It's just a number of what you look like at that particular time, so that in five or seven years, there may be enough of an accumulation that you may be in preclinical AD,” Dr. Ances said. Dr. Ances said disclosing a diagnosis of preclinical AD can be very important, however, because if the amyloid scan is positive, this can help the patient and the family to plan appropriately and make decisions for future care and treatment. Lisa Mosconi, PhD, associate director at Weill Cornell's Alzheimer's Prevention Clinic in New York, said counseling is extremely important if and when PET results are to be disclosed, as it's difficult to gauge patients' reactions to the news of an amyloid positive scan. But she was concerned about the use of amyloid PET in patients without a dementia diagnosis. Currently in the US and Europe, two large clinical trials are testing the clinical outcomes of these scans. •. de Wilde A, van der Flier WM, Pelkmans W, et al Association of amyloid positron emission tomography with changes in diagnosis and patient treatment in an unselected memory clinic cohort: The ABIDE project https://jamanetwork.com/journals/jamaneurology/article-abstract/2683867. JAMA Neurol 2018; Epub 2018 Jun 11. 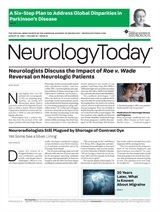 Neurology Today18(16):18-20, August 16, 2018. Neurology Today Conference Reporters in 2016!